Places to go around Hampton Roads, the Chesapeake Bay, and the Caribbean. We’ve listed below some of our favorite places to go by boat, local businesses that we do business with and other attractions around Hampton Roads, the Chesapeake Bay, and the Caribbean. When you join SailTime you’ll be able to start spending time with your family and friends doing the things you want to do in and around our community. 4801 Pretty Lake Ave. – P: 757-362-3600 – www.littlecreekmarina.com. 1525 Bayville Street – P: 757-583-4150 – Get DirectionsTo reach the marina office, call 757-583-4150. Located at the east end of the Hampton Roads Bridge Tunnel, our marina is very convenient to all of the Greater Tidewater area, as well as Williamsburg, the Northern Neck, and Richmond. Willoughby Harbor Marina (WHM) a 271 slip marina is centered in the most popular recreational boating area in Virginia at the mouth of the James River on the lower Chesapeake Bay adjacent to Bayville Street. Norfolk’s Ocean View Beach, home of WHM, offers a spectacular seven-mile stretch of glittering sandy beaches. The bay’s calm surface and gentle surf make the beach the perfect place for sunbathers, swimmers, and families with children. The Old Cape Henry Lighthouse was built in 1792. It started to crack in 1870 and was replaced with the new Cape Henry Lighthouse only 357 feet away, which is an active aid to navigation and operated by the U.S. Coast Guard. The Old Cape Henry Lighthouse is maintained by the APVA and is a National Historic Landmark, serving as the official symbol for the City of Virginia Beach.This light is important to SailTime members because it marks eastern boundary of travel. Hampton Public Dock: 757-727-1276Glide through the warm waters of the Chesapeake Bay, visit the $32 million dollar Virginia Air and Space Center, or take a ride on a 1920 carousel located on the downtown waterfront. Or how about a pleasant, Sunday outdoor concert, or children’s theater, or an exhibit on waterfowl paintings. And, for jazz, pop and rhythm and blues, the Hampton Jazz Festival features some of the finest acts in the business.Be sure to ask about the goings on on Queen Street. 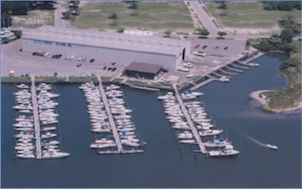 Bay Creek Marina and Resort, located in the protected harbor of King’s Creek, provides deepwater access with a seven feet MLW channel. It is the perfect port for exploring the Intracoastal Waterway, the blue-green waters of the Chesapeake Bay and the open seas of the Atlantic Ocean. The Marina is a state-of-the-art facility boasting 224 slips (upon completion, currently has 120), two restaurants, Aqua and Cabana Bar, on property, a marine store (The Complete Angler) and a full time harbormaster. All of this is arranged in a pedestrian friendly village complete with the Village Merchants shops and so much more. Middle Ground Light. In 1871, the United States government established a light station to mark the underwater L-shaped shoal in the middle of the Hampton Roads shipping lanes. This caisson lighthouse was completed and first lighted in 1891 at a cost of $50,000. The lighthouse was fitted with a fourth-order Fresnel lens.The over all structure is 56 feet tall and has a three story keeper’s quarters.The original fog signal was a bell, which was struck a double blow every 15 seconds by a Stevens machine. In 1954, the signal was changed to one blow every 15 seconds.The current light is on a pole out side the lantern room. The light was automated in 1954 and the two keepers removed. In 1979 a ship hit the lighthouse and caused water to leak into the lower part of the caisson.The lighthouse is located in about 15 feet of water, on the west end of Newport News Middle Ground, Hampton Roads, and Newport News, Virginia. New Point Comfort LightCommissioned in 1804 to mark the north side of Mobjack Bay and the York River, this is the third oldest lighthouse on the Bay, Despite it’s name, it has no relation to the Old Point Comfort light apart from the fact that both were built by Elzy Burroughs (who later served as keeper here).The octagonal whitewashed sandstone tower stands 58 feet tall and the fourth order Fresnel lens, installed in 1865, gave it a visibility of 13 miles. The light was partially automated in 1919 and the keepers house was torn down at that time. It was completely automated in 1930. In 1933 a hurricane swept away the peninsula’s link to the mainland leaving the light on its current small rocky island, accessible only by small boat.An offshore light took over the tower’s duties in 1963 and in 1968 the Coast Guard discontinued maintenance. It is now owned by Mathews County and has undergone several renovations. Vandalism continues to be a problem. Tidewater Marina in Portsmouth is a great place to stop and rest along the Intracoastal Waterway at Mile Marker Zero. With the deepest natural harbor, boaters have easy access to the ocean and Chesapeake Bay. to cook your own you can make use of one of our charcoal grill by the picnic area.Whatever you choose there are plenty of options available at Salt Ponds Marina Resort. Severn River Marina. Full service marina at the west end of the Mobjack Bay – Severn River – southwest branch804-642-6969. Our forty acre yachting complex situated just off Mobjack Bay, approximately 6 miles to the Chesapeake and 25 miles to the Atlantic. Largely undeveloped and extraordinarily picturesque, this region of the Chesapeake provides tranquil cruising grounds and safe anchorages – yet is located within 30 minutes of three international airports, extraordinary golfing facilities, white sand beaches and charming historical areas.We offer all the amenities and comforts you’d expect from any first-class marina, but with a special feeling you’ll only find here. A friendly, laid-back home for you and your boat where you’ll be known by name, not by a slip number.Come and experience the warmth and congeniality of the community of families, friends and neighbors we call Severn River Marina. Coupled with our state of the art yachting facilities and unsurpassed dedication to customer service, we think its paradise. The Marina at Smithfield Station is designed with boaters in mind. All our piers are floating docks and free high speed wireless internet is also available. Most of our slips connect directly to cable television so you can catch the game Saturday afternoon.We can accomodate boats up to 130 feet in length. Prior reservations are recommended from May to September. Hot showers are available. Full service hotel and restaurant on premises. The Marina monitors VHF Radio on Channel 16. Transient rates are $1.75 per foot and include electric. Tangier Island. This is a tiny stretch of sand in the middle of the Chesapeake Bay (really a cluster of islands), just south of the Virginia – Maryland state line. Don’t even try to look for it on a map (unless you’ve got a very detailed one); the main island is less than two miles long and half a mile wide, and it barely sticks out of the water.Tangier Island has been settled more than three hundred years ago by six or so fishermen families from Cornwall, England; they have been living there ever since, making their lives off the Bay. They have preserved their closeness to the sea, the slowly paced lifestyle, even this special melody of speech, not encountered anywhere else.The islanders are also quite willing to let you have a glimpse of their life – and a bite of their food. And both are experiences well worth trying. The Wolf Trap light is located in 16 feet of water on the eastern end of the Wolf Trap Spit south of where the Rappahannock River enters the Chesapeake Bay. It is a caisson tower with its light 52 feet above mean high water.